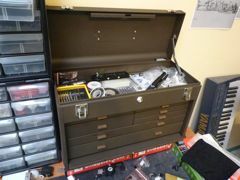 This is the best toolchest ever, if you do electronics or other small tasks. My dad was an avionics tech, he knows how to fix any electronic thing in an airplane. He’s had a toolbox like this as long as I can remember. He used to take in on planes when he’d fly to go fix them. Kennedy has been making them in Ohio, apparently unchanged, for like 100 years. 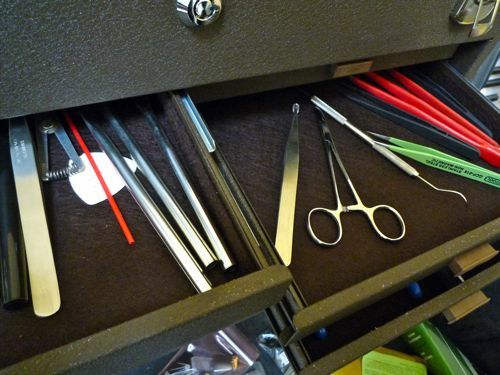 The toolchest has several felt-lined drawers (so the tools don’t shift around), with adjustable metal dividers in the drawers. A front cover hides all the drawers and protects them when the chest is closed, otherwise it slides underneath the drawers in a little pocket. It has this crinkly brown enamel paint job. 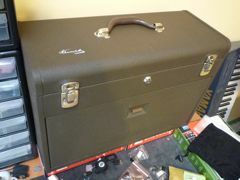 I have a pair of the Kennedy 520 Tool Chests. I have used them for over 40 years. As a Space Lab Tech I used one for instrumentation supplies and one for tools. Later for gunsmithing I used one for machinist measuring tools (micrometers, etc) and one for specialized gunsmithing tools. Both have given excellent service. It is ironic that the current price of a used one in very good condition can be more than I paid for the pair when new. 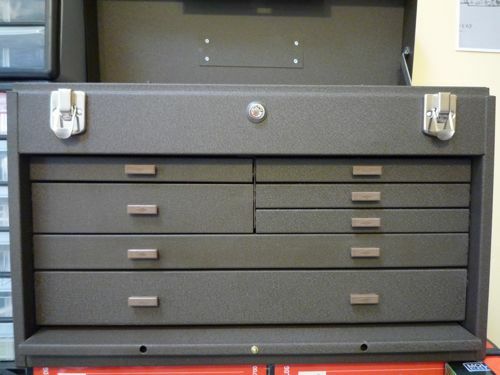 Would it be too much of an intrusion to ask for more pictures of the tools in the case? Always curious as to what other people use.